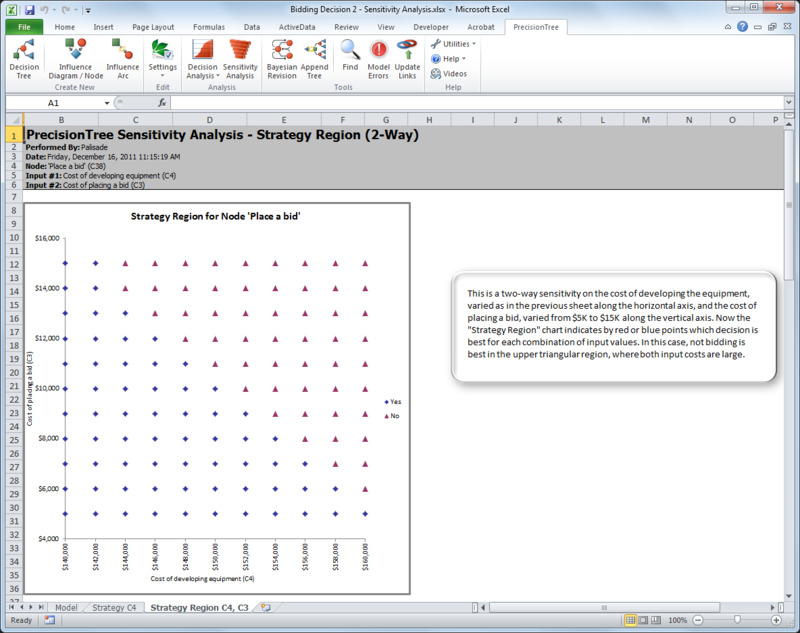 Palisade PrecisionTree allows you to visually map out, organize, and analyze decisions using decision trees, right in Microsoft Excel. Decision trees are quantitative diagrams with nodes and branches representing different possible decision paths and chance events. This helps you identify and calculate the value of all possible alternatives, so you can choose the best option with confidence. 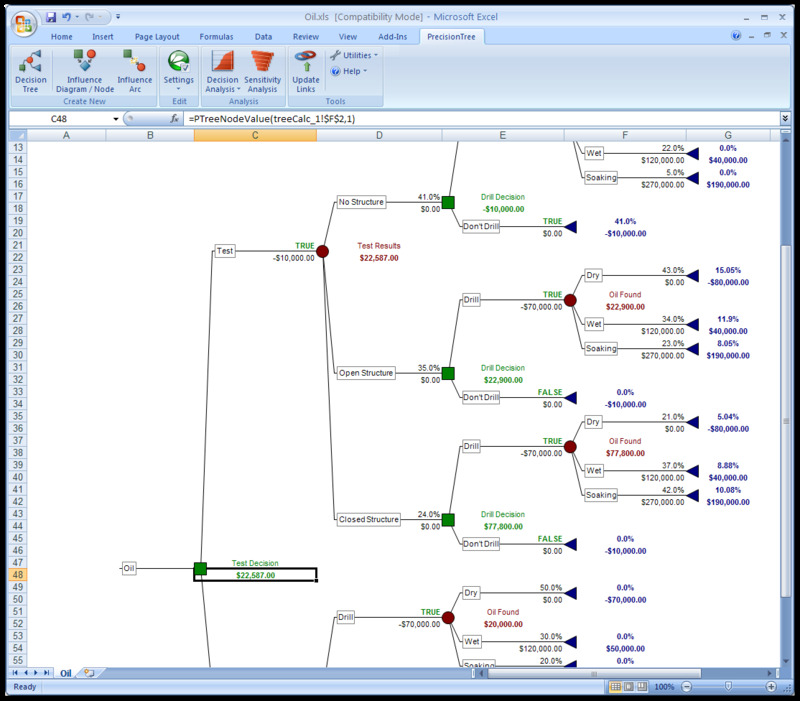 PrecisionTree Professional enables you to map out decision trees with UNLIMITED nodes. PrecisionTree Professional enables you to map out decision trees up to 1000 Nodes. @RISK performs risk analysis using Monte Carlo simulation to show you many possible outcomes in your Microsoft Excel spreadsheet—and tells you how likely they are to occur. New in version 7 is the ability to build efficient frontiers, use copulas and a host of usability enhancements. 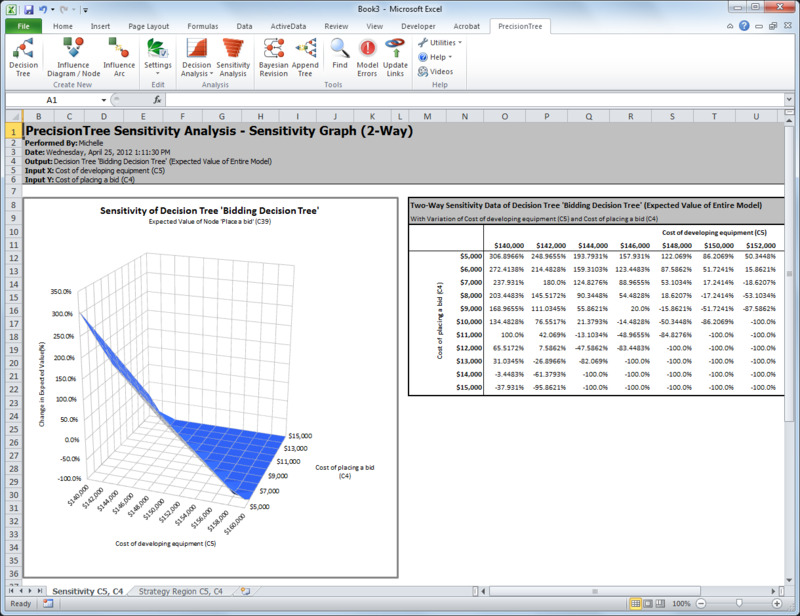 The DecisionTools Suite is an integrated set of programs for risk analysis and decision making under uncertainty that runs in Microsoft Excel. The DecisionTools Suite includes @RISK for Monte Carlo simulation, PrecisionTree for decision trees, and TopRank for “what if” sensitivity analysis. In addition, the DecisionTools Suite comes with StatTools for statistical analysis and forecasting, NeuralTools for predictive neural networks, and Evolver and RISKOptimizer for optimization. All programs work together better than ever before, and all integrate completely with Microsoft Excel for ease of use and maximum flexibility. 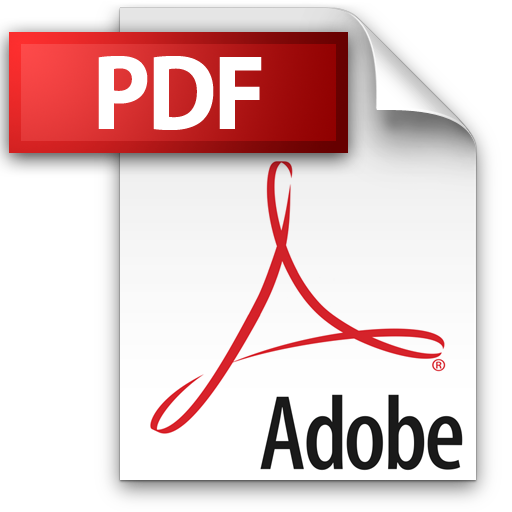 Build your own risk analysis package with Risk Simulator 2012- Your Edition. 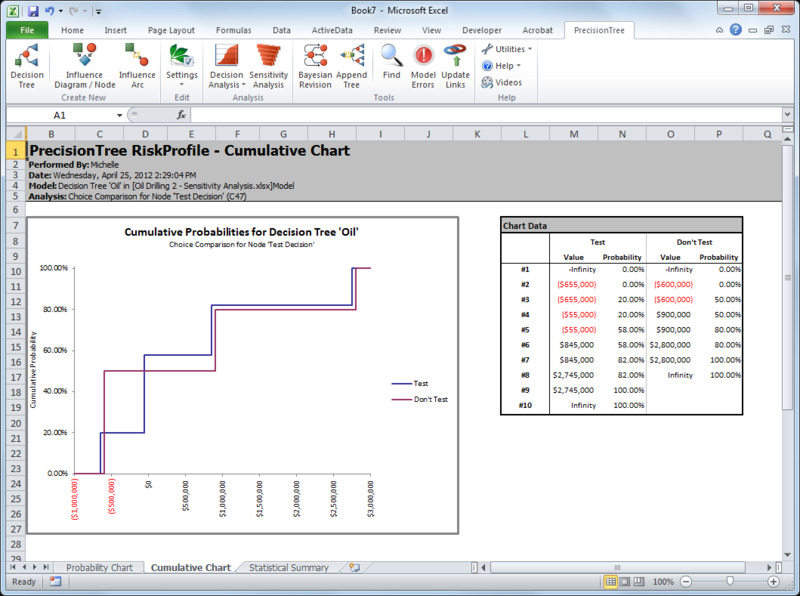 Risk simulator is a complete simulation tool for Excel that enables you to add the features you need and want. Check out the modules below. Decision trees provide a formal structure in which decisions and chance events are linked in sequence from left to right. 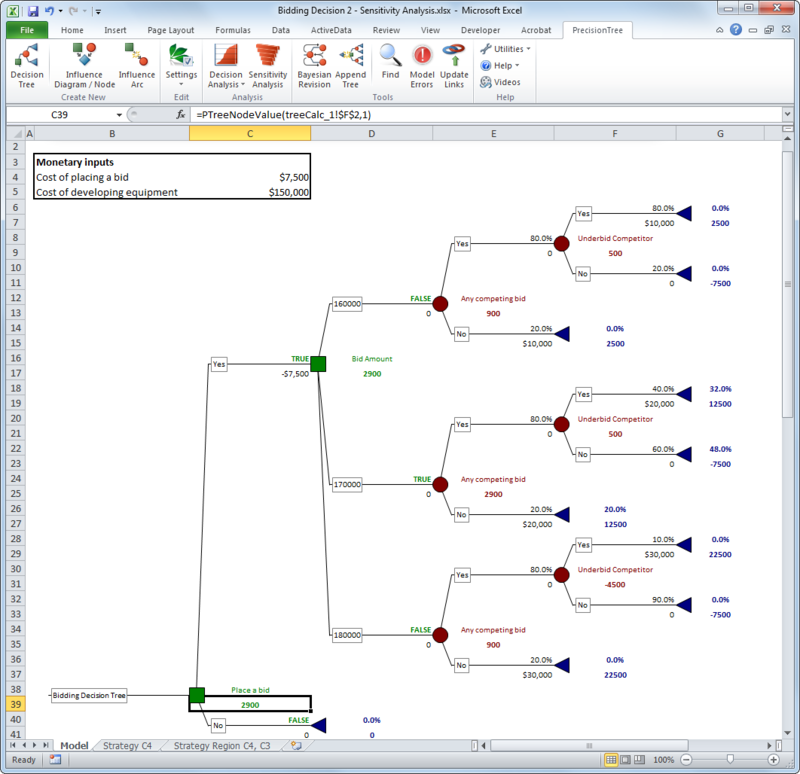 Decisions, chance events, and end results are represented by nodes and connected by branches. The result is a tree structure with the "root" on the left and various payoffs on the right. Probabilities of events occurring and payoffs for events and decisions are added to each node in the tree. With PrecisionTree, you’ll see the payoff and probability of each possible path through a tree. PrecisionTree functions may be added to any cell in a spreadsheet and can include arguments that are cell references and expressions - allowing great flexibility in defining decision models. You can also collapse and restore branches to the right of any given node for simplicity and easier navigation through the tree, and insert nodes at any point in a tree. You can even append symmetric subtrees to particular nodes, greatly speeding up the building of large models. Bayesian Revision – This lets you to “flip” one or more chance nodes in a model in order to show probabilities calculated using Bayes’ Rule. This is valuable when the probabilities of a model are not available in a directly useful form. 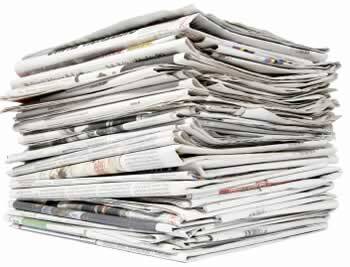 For example, you may need to know the probability of an outcome occurring given the results of a particular test. The test’s accuracy may be known, but the only way to determine the probability you seek is to “reverse” a traditional tree using Bayes Rule. Logic nodes – A special type of node where the optimum branch is selected according to conditions the user defines. A logic node behaves like a decision node, but it selects the branch whose branch logic formula evaluates to TRUE as the logical (optimum) decision. Reference nodes – Are used to reference a sub-tree. 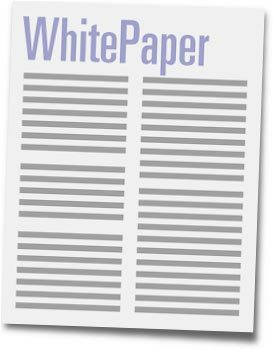 The sub-tree can be on any sheet in the workbook. Use reference nodes to simplify a tree, to reference the same sub-tree many times in a tree, or to build a tree that’s too large to fit on one spreadsheet. Linked Trees – Allow the branch values for a decision tree to be linked to cells in an Excel model external to the tree. Each node can be linked to an Excel cell reference or range name. End node payoffs can be calculated by a detailed spreadsheet model. This powerful feature combines the strength of a decision tree for describing decision situations with the strength of a traditional spreadsheet model for calculating results. Payoffs with VBA Macros – PrecisionTree can calculate decision tree path payoff values using a custom VBA formula. Using this method, you can drastically simplify your models. Custom Utility Functions – Converts a model’s monetary payoffs into “utility” to account for the decision maker’s attitude toward risk, which can affect the optimal decision choice. PrecisionTree offers a default exponential utility function, but, using VBA custom functions, you can easily construct your own custom utility function. 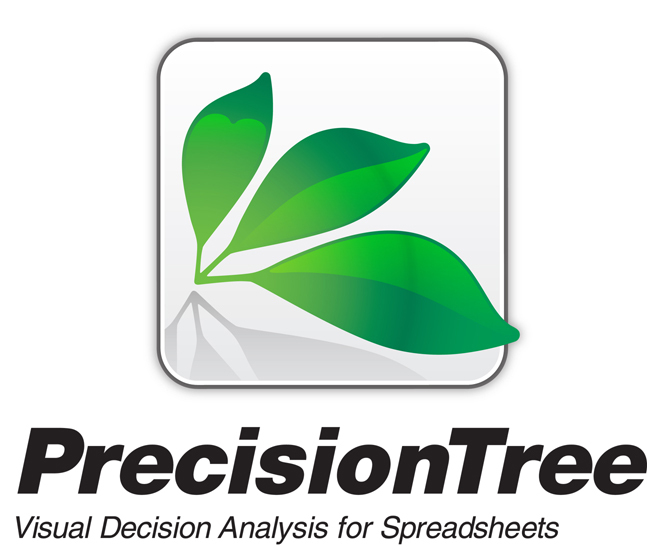 PrecisonTree Developer Kit – Built-in programming language that allows you to automate PrecisionTree using Excel VBA. 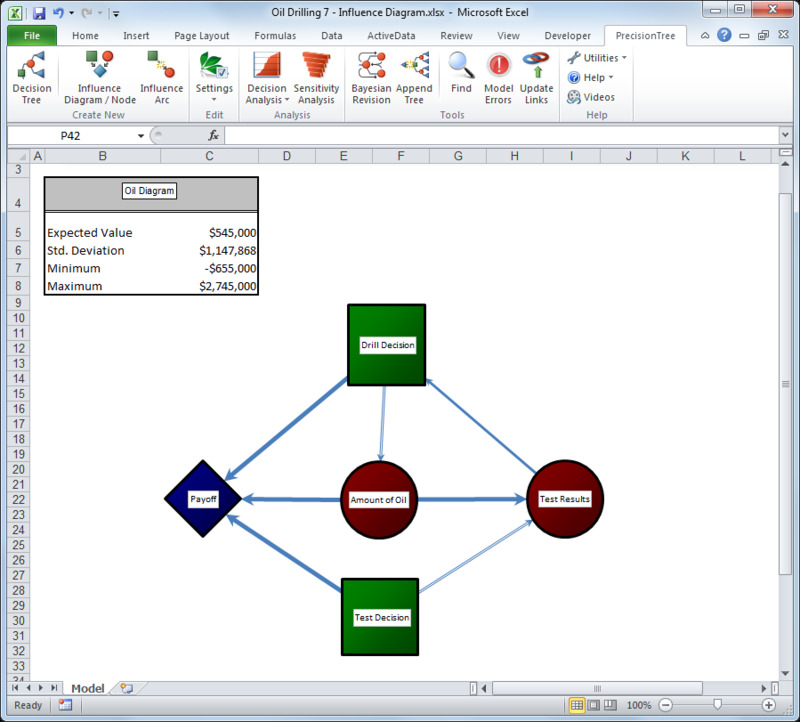 Influence Diagrams – Using nodes and arcs, influence diagrams are used to summarize the general structure of a decision. They can also represent asymmetric trees. You can convert influence diagrams into decision trees.